Two-toned watches are becoming increasingly popular among watch enthusiasts. It’s easy to see why: two-toned watches offer incredible versatility, both in the watch’s design itself and in wearability. The major watch brands, including Rolex, have picked up on the public’s love of two-toned watches; now they’re everywhere you turn. To celebrate this burgeoning new trend, we’ve highlighted five of our favorite two-toned Rolexes that would be the prize of any horologist’s collection. 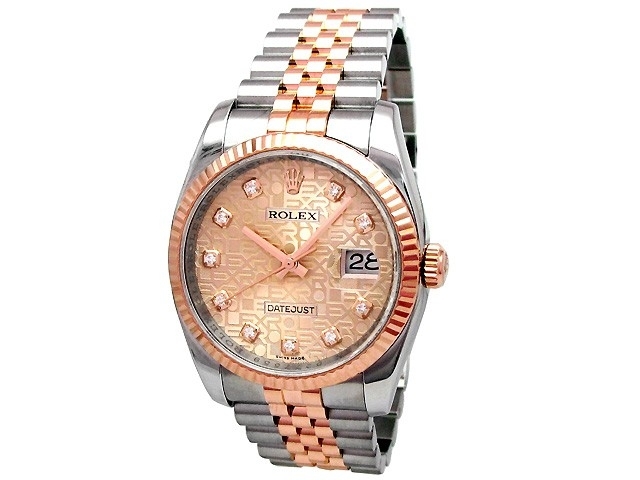 This rose gold and stainless steel Rolex Datejust is both elegant and trend-savvy. The contrast between warm rose gold and icy stainless steel creates a unique and contemporary juxtaposition in this piece, while the rosy, diamond encrusted dial adds an air of luxury and sophistication. This stainless steel and 18k gold Yachtmaster perfectly embodies this famous model’s “spirit of the sailor” motto. 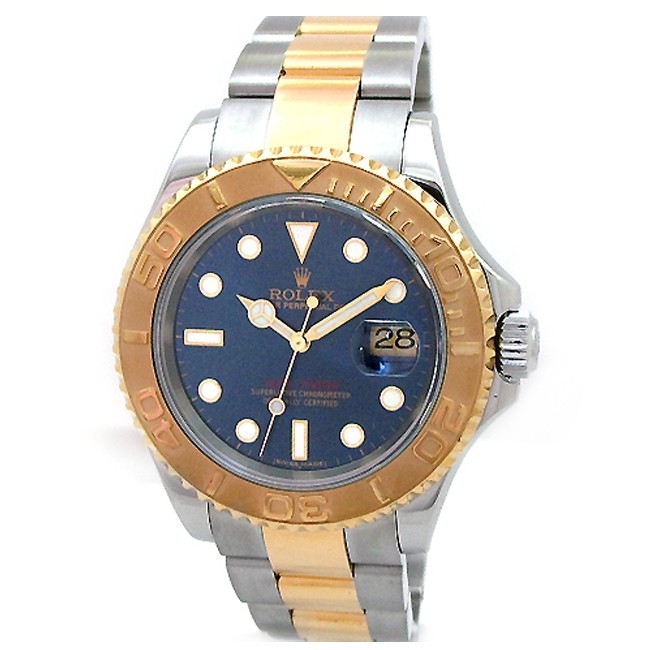 The gold, silver, and royal blue coloring on this watch creates a distinctly nautical style, which is further enhanced by the bold, graphic white and gold dial markers. This watch is luxe, sporty, and classic. The Rolex GMT-Master II is the ultimate adventurers watch. This watch was build to withstand any expedition, whether it’s sailing the high seas or climbing to the top of the highest mountain. This particular GMT-Master II model adds some luxurious touches to this traditionally rugged watch, using elements of 18k gold to add refinement. The black dial and outer bezel adds depth and richness to this timepiece, further heightening this piece’s bold style. 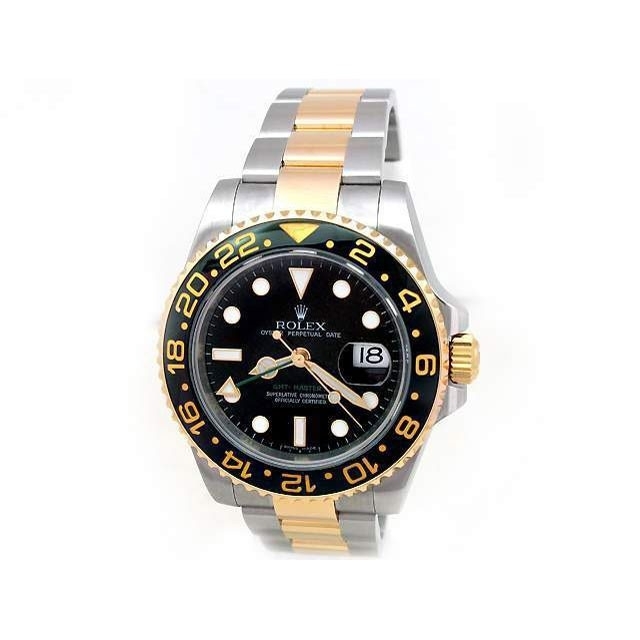 This two-toned Rolex uses some unique design elements to add an air of elegance to the classic Submariner model. Here, Rolex’s signature Serti dial, set with eight glittering white diamonds and three geometric sapphires, makes the already upscale Submariner even more opulent. The two-toned watch band, made in 18k yellow gold and stainless steel, echoes the champagne color of the dial, adding to the cohesiveness of this handsome timepiece. 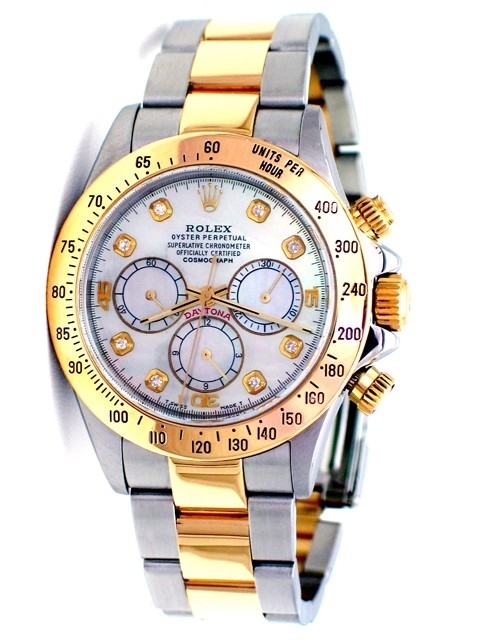 This Rolex Daytona is masterfully designed. This model features Rolex’s highly sought-after mother of pearl diamond dial, which is set with eight white diamonds surrounded by 18k yellow gold. 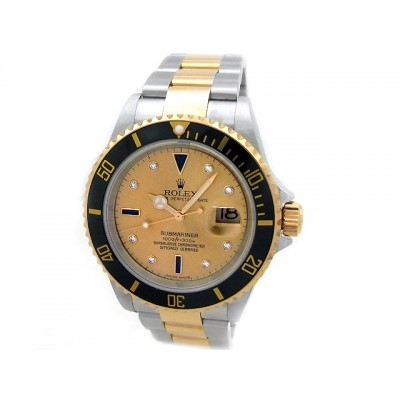 Touches of gold are used throughout this design, with a gold outer bezel, a gold crown, gold pushers, and a two-toned gold and stainless steel strap. The luxe touches on this classic racing watch create an enviably sophisticated look. Want to see even more versatile two-toned luxury watches? Browse our entire two-tone collection.